Garden Seeder Reviews | A complete source for some real timesavers! These Garden Seeder Reviews List Some Awesome Seeders! But, just what is a garden seeder? Simply put, it is a machine that will plant your seeds. Garden seeders are designed to evenly space a variety of sizes and shapes of seeds at a consistent depth throughout the row. They can even cover the seeds and tamp down the soil over them to ensure that the seeds make good contact with the dirt. Such an amazing machine can only be given true justice with the garden seeder reviews listed below. Who Needs One of These Contraptions? Historically, seeders have been used by commercial farmers for a long time to plant acres and acres and acres of crops that are grown for sale to local markets. 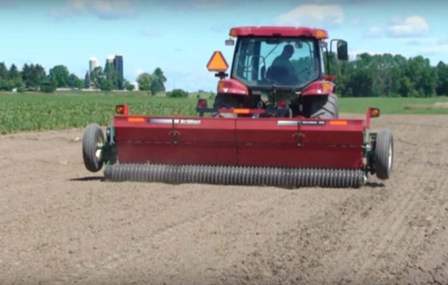 This Brillion seeder is an example of a seeder used on a moderately sized commercial farm. Until recently, only these large-scale agricultural operations had a real need for them. And, they could get really expensive – starting at a few thousand dollars to well over $100,000! But, increasingly, home gardeners have gravitated to growing larger and larger gardens. Thus they have created a demand for this time-saving piece of equipment in a stepped down version. Now, if you have a tiny little garden plot of just a couple hundred square feet, you don’t need a garden seeder. Just plunk the seeds into the ground, kick some dirt over them, tamp the down, and add water – and, you’re home free in just a short time. However, garden seeders are great back-savers – and time savers – for mid-sized to large-sized gardens that encompass an area of 1 or 2 thousand square feet – or more. 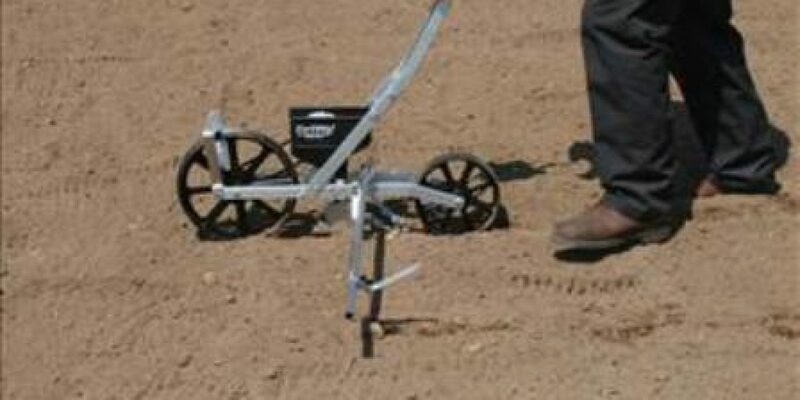 The planting depth is adjustable from about a quarter inch up to 2 inches deep using either a wedge-shaped ground opener – or a rolling coulter which is a double disk furrow opener such as the one used on the Hoss HGS051 Garden Seeder. The ground opener makes a furrow into which the seeds from the hopper drop at a consistent spacing – based on the holes (or cups) on the seed plate. Garden seeders use seed plates in a seed hopper. If the seed plate is positioned horizontally, seeds drop into holes – on by one – in the rotating plate and, as the plate passes over the hole in the bottom of the hopper, the seed passes down a drop chute into the soil. A seed plate that is positioned vertically will have cups to catch the seeds and direct them to the drop chute at the bottom of the hopper. Several sizes of seed plates – usually 6 – are furnished with the garden seeder. As a rule, they will accommodate 90% of the various seed sizes. For horizontal seed plates, blanks can be ordered to custom make a plate for odd-sized seeds that may need to be planted and do not correctly fit the supplied plates. 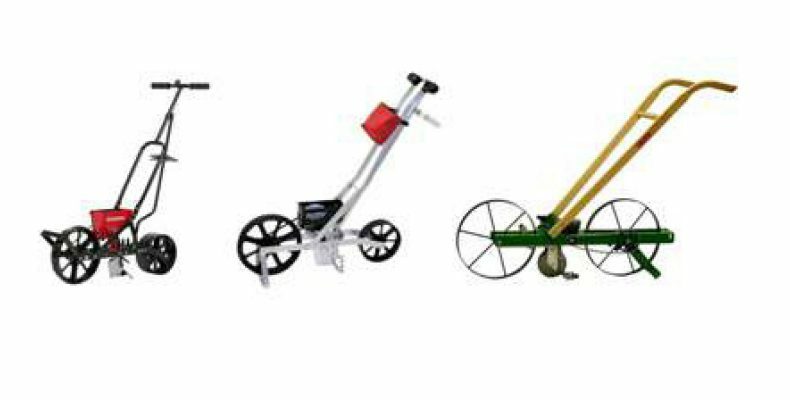 The garden seeder manufacturers will provide text instructions and videos to walk you through creating your own special sized seed plates. 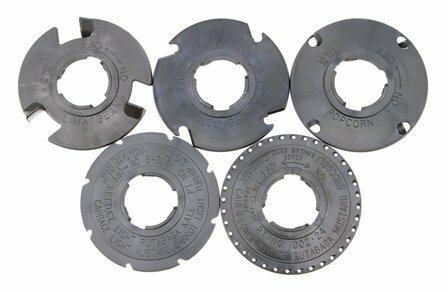 For vertical seed plates, the manufacturer will often times offer an optional accessory seed plate set that covers a number of odd-sized seeds – such as this Earthway set. Seed spacing is determined by the number of holes (or cups) in the seed plate and the distance it takes for the plate to make one complete revolution. Example – If a seed plate has 4 holes (or cups) and it takes 20 inches of row distance to make one complete revolution of the plate, then a seed will be placed every 5 inches. An easy way to increase the spacing to 10 inches is to put a small piece of masking tape over 2 of the holes – opposite each other. The soil should be no more than very slightly moist. If it is too wet, it will clog up the drop chute on the seed hopper. Push the garden seeder at a slow walk. This is not a horse race. You want to ensure that each seed has the time to individually fall down the drop chute in turn so you don’t skip any spaces. A bar or chain drags on the ground behind the hopper to pull dirt over the seeds as the drop from the seed hopper. Then, the back wheel – which is usually a bit wider than the front wheel – tamps down the dirt to make good contact with the seed. There is a kickstand to keep the seeder upright when not in motion. Just don’t try to use it on a windy day – given the lightness of the machine, chances are that you may still end up with seeds all over the ground. And, that’s all there is to it! This is a simple, functional piece of equipment that can save a lot of time and energy for the serious gardener! Expect to spend anywhere from a little less than $100 to between $300 and $400 – depending on how much quality you want. And, remember – a good rule of thumb is that you get what you pay for. As new and improved seeders become available for home gardeners, they will be researched and discussed thoroughly to allow you to make an informed decision on whether you need one and which is best suited for your unique situation. 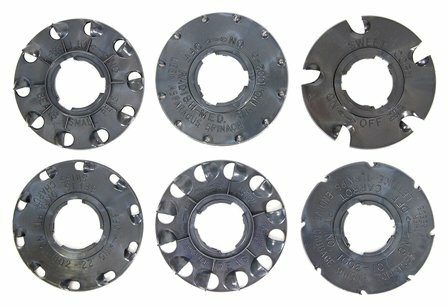 Most garden seeders include up to a half dozen different sized seed plates to accommodate the various sizes of seeds. If you are planting lettuce, you don’t want to use a seed plate designed to sow large bean seeds. Those tiny lettuce seeds will flood out the large holes very quickly – dropping hundreds of seeds in the same spot. Thus, it behooves you to determine which seeds you will be planting directly into the soil and ensure that the garden seeder supplies the right size seed plates for your needs. 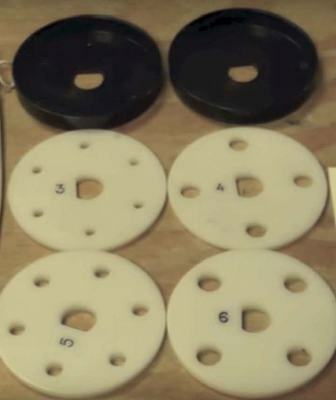 A typical array of included seed plates will list which plates are used for which seeds. After extensive interviews, trials, and research, there are a few garden seeders that stand out in the crowd. These seeders are easy on the wallet and can satisfy any home gardener’s planting needs. Chapin 8701B Garden Seeder – A great entry level garden seeder for a medium sized garden of 1,000 square feet or less. Built well and available for less than the price of a quality weed eater! Earthway 1001-B Precision Garden Seeder – This seeder is a cut above the Chapin 8701B. It has a lighter chassis and comes with a super 5 year warranty – while still being easy on the pocketbook. 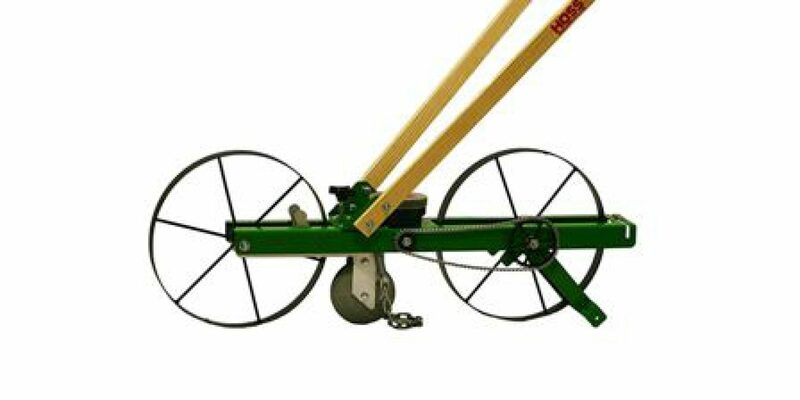 Hoss HGS051 Garden Seeder – If you have a medium to large sized garden, this planter is the ticket you need! The horizontal plates and the quality detailed construction make this the most accurate garden seeder available on the market today! Do you use a garden seeder? Did you even know that they were available for home gardening? I welcome your comments and emails. Thanks a lot for this extremely informative post. We’ve got a good-sized garden around our house, but I cannot, by any stretch of the imagination, call myself a gardener. I mow the lawn and do the weeding…that’s it…for now. But your post got me excited. All my favorite vegetables were covered by the 6 plates you list, and just the thought of having several of these vegetables being grown at our house is compelling. Especially with 3 kids between the ages of 4 and 11, and already well-trained in cutting grass and pulling weeds. 🙂 The next step beckons! I’m glad you enjoyed Garden Seeder Reviews. 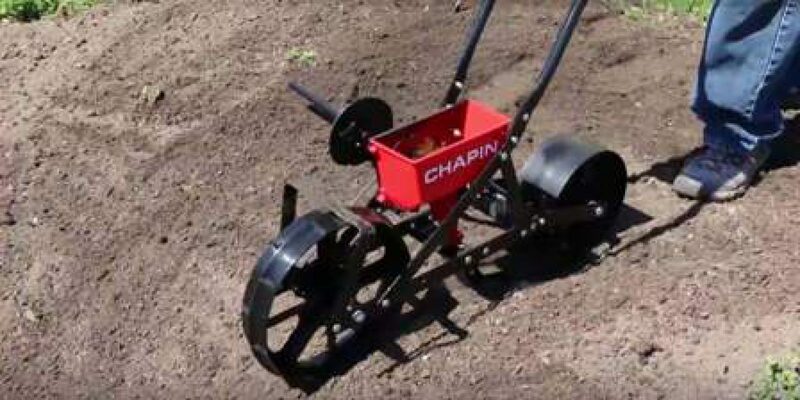 Did you get a chance to look at some of the garden seeders I reviewed – such as the Chapin 8701B or the Earthway 1001-B? And, since your kids are already becoming grass cutting experts, I’m sure they will do you proud as young master home gardeners – at least when it comes to weeding because, that’s when it pays to have some kids around!